Research Droids Reviews continues and takes a look at the TARGET exclusive Jabba's Rancor With Luke Skywalker set. This massive beast is sure to take up more than some room in your collection. Click the Research Droids banner for our Research Droids Reviews archive index or the thumbnail for the direct review below! Don't forget you can also e-mail us your review requests and we'll be sure to add your choice to the queue. Another entry of Research Droids Reviews is posted today and we look at another figure from the popular The Clone Wars line. Jar Jar Binks evokes different emotions in different Star Wars fans and we look at how well he was translated into plastic. Click the Research Droids banner for our Research Droids Reviews archive index or the thumbnail for the direct review below! Don't forget you can also e-mail us your review requests and we'll be sure to add your choice to the queue. Stop by Hasbro's Web site for their latest Galaxy-wide Q&A. Click here to see a comprehensive list of all the questions and answers posted in the May 22nd edition! Legacy Collection Wave 2 2009 is now here along with Transformers 2: Revenge of the Fallen figures! But that is not all this week, we have new vehicles and Marvel Universe figures. Get the The Thing and Red Hulk! Check out the complete newsletter! Today's edition of Research Droids Reviews focuses on another recent figure released in The Clone Wars line. We expect to see many forthcoming clone troopers, after all, it's all about the clones, so we take a look at the Clone Trooper (41st Elite Corps) in all of its phase I glory! Click the Research Droids banner for our Research Droids Reviews archive index or the thumbnail for the direct review below! Don't forget you can also e-mail us your review requests and we'll be sure to add your choice to the queue. Only 3 Obi-Wan Kenobi 12" Figures Found At Sideshow! Sideshow Collectibles found only three 12" Obi-Wan Kenobi (Attack Of The Clones) figures in their warehouse. Order yours now! There are only 2500 total pieces of this worldwide! Premium Format Count Dooku Edition Size Only 750! Sideshow Collectibles would like to let Star Wars fans know that theie Edition Size for the Count Dooku Premium Format Figure has been set at a very low 750 pieces worldwide and is now sold out! If you missed out on placing your pre-order there is a possibility that you could obtain this Sith Lord for your collection if you sign-up for the Wait List! Forthcoming 12" Figure Environments From Sideshow! Sideshow Collectibles has announced three upcoming 12" Figure Environment sets to be released for pre-order soon. From what we can tell, we only see one Star Wars themed environment, but it looks pretty cool! Check it out! Sideshow Collectibles has posted the edition size on their regular version of the 12" Lando Calrissian figure. With a small run of only 1500 pieces (and an exclusive run of 750 pieces), this will be one of the smallest produced figures in their incredible line of 1/6 scale collectibles. Don't hesitate and get on the exclusive or regular Wait List reservation now! Both versions are currently sold out! "Ask Sideshow" Final May Fantacular Edition Posted! Sideshow Collectibles has either confirmed or alluded to the following 12" figures in their latest edition of "Ask Sideshow": C-3PO, R2-D2, Gamorrean Guard, and Grand Moff Tarkin. There are some other interesting tidbits posted too! Click thumbnail to read about all of the other potential items that may see the light of day in our display cases! Research Droids Reviews - You Choose! We have been receiving such an overwhelming response from our Research Droids Reviews, we would like to extend a courtesy to you our readers and make it more interactive. If you have a figure or product in mind that you would like to see reviewed, please e-mail us here and we will be sure to add that to our archives. Thank you so much for your support! We have another installment of Research Droids Reviews for you! Today we shift gears a bit and look at the Scramble On Yavin Battle Packs set as a whole. One of the neatest things to come from Hasbro in years, we fear that future sets may not equal the magnitude of this one. Based on a scene from A New Hope, this multipack from The Legacy Collection is certainly not to be passed up. Click the Research Droids banner for our Research Droids Reviews archive index or the thumbnail for the direct review on the Scramble On Yavin Battle Packs set below! TRU Spring Cleaning? Exclusives And More Marked Down! TRU is beginning to take stock of their inventory and clearance out some Star Wars stuff. We just found the Ultimate Quarter Scale Darth Maul for $59.98 (which we hope doesn't foretell the future of this line since we barely only saw two at retail thus far), the Disturbance At Lars Homestead set has been marked down to $39.98 and don't forget about the Rogue Squadron B-wing Fighter which has been down to $29.98 for a while now. We cannot believe these are 'clearance' prices. But if you want these items, they might be disappearing soon since everyone is looking to save as much he can with toys in The Legacy Collection. Welcome to another Research Droids Reviews archive entry! Today we look at a very cool figure that probably will not receive his due credit; Luke Skywalker (based on the medical frigate scene in The Empire Strikes Back) from The Legacy Collection. Click the Research Droids banner for the review archive index or the thumbnail for the direct review on Luke Skywalker below! First Look! Han Solo In Carbonite 12" Figure Environment! The second 12" Figure Environment has been released from Sideshow Collectibles in the form of Han Solo In Carbonite. This expensive collectible is very nice, but we have determined that the $199.99 sticker is overpriced. And we would probably still have to say it was too expensive at $149.99. But - with all that being said - click through and check out some detailed images of this beautifully executed collectible. LEGO and Star Wars are two of the world's most well-recognized and successful franchises, and have been collaborating since the 1998 release of the first LEGO Star Wars mini-figures. In true DK style, the Visual Dictionary elucidates, illuminates, and excites even the most discerning LEGO, Star Wars, and mini-figure fans around the world. As an added bonus, you also get an exclusive mini-figure found only with this book! Check out the details and pre-order today at Entertainment Earth! Today's entry into our Research Droids Reviews archive is for Kit Fisto from The Clone Wars line. Click the Research Droids banner for our index or thumbnail for the review on Kit Fisto below! TARGET Jabba's Rancor - Variation Already!!! We know that the Jabba's Rancor With Luke Skywalker TARGET exclusive is NOT even officially out yet, but we already have a variation to report. Please don't shoot the messengers - we are growing weary of this just as much as you are! We have found some with a dull white wash while others have a shiny dark brown gloss finish. We are inclined to think that the "shiny" one is the corrected version, only because it "looks better" than the "aged" look of the white wash sample. We have provided pictures of both for you to compare. Click through for the madness! We have added a new entry today into our Research Droids Reviews archive for Emperor Palpatine from The Legacy Collection. Click thumbnail below for all of the details! 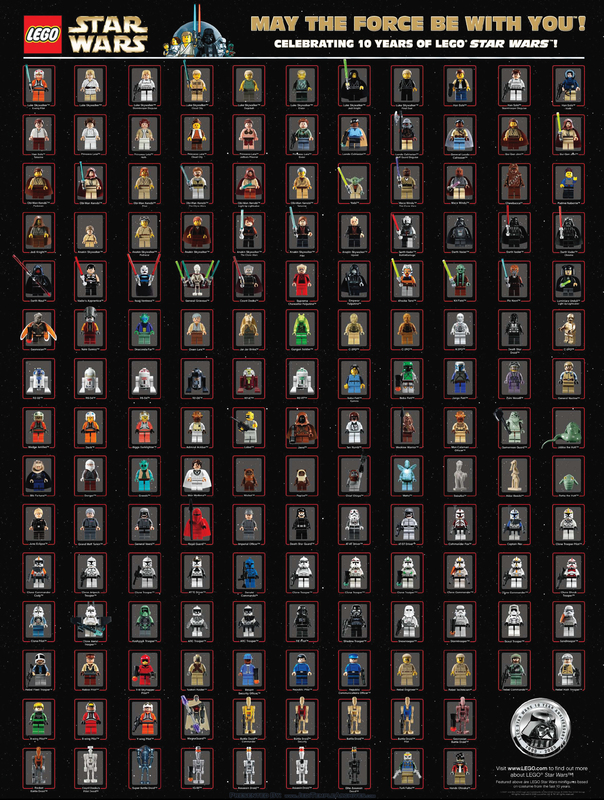 Earlier this month LEGO.com had a sale celebrating 10 years of LEGO Star Wars where you could pick up a very exclusive poster featuring all of the mini-figures in the LEGO Star Wars Universe. Click below for a a high res look at this cool poster! Want an even closer look? Download a super-hi res version right here! JTA Introduces New Feature: Research Droids Reviews! Welcome to our new segment entitled Research Droids Reviews! In this new post we will review action figures and other licensed Star Wars product and provide you with details, photos, and impressions of the best collectibles offered to collectors like us. Up first, we look at the recently released Ugnaught (BD 43) from The Legacy Collection. Found! (Well, not so much "found" as "politely begged for.") The Jabba's Rancor With Luke Skywalker is making its way across the land just in time for Memorial Day. Be sure to check your local TARGET locations for this impressive exclusive. If you need assistance and are lucky enough to come across a customer service-focused associate, use DPCI 087-06-2066, just please don't get vocal if they decline to help you! These will be available everywhere soon! Click thumbnail for larger image. Here is a quick update from http://www.bigbadtoystore.com about a variety of new arrivals and many more exciting new preorders - please take a look at the big list right here! Check out our Hasbro Q&A #71 round-up report available now in our forums to find out the answers to the questions our colleagues asked. Click here to read it all and remembering to keep checking back with us as more sites post their answers! Great products in stock this week! Tons of Vintage Transformers Generation 1 Loose and Star Wars Graded Coins have been added. Sideshow 12" Toht is in stock. Most importantly, 2009 Legacy Wave 2 is arriving soon, head to brianstoys.com and place your orders now! Check the complete newsletter here! We've got questions... Hasbro has answers! Click through for the latest Hasbro Q&A! OK, so we know you read our first report here, because all of you want to see better photos that clearly show the Jabba's Palace variation just recently discovered. Ask and ye shall receive. Click through for a gallery of better shots and zooms to see what we are talking about here. Found! New "The Clone Wars" Vehicles! New The Clone Wars vehicles including the Vulture Droid and Magnaguard Fighter have been found at WAL*MART, TARGET and Toys R Us locations throughout the 50 states. They really are great vehicles and overdue additions to the line! Sideshow Perfects The Prometheus Body Form! Sideshow Collectibles has posted a Production Blog update highlighting important changes that have been made to their proprietary Prometheus 12" body form used to make our wonderful Star Wars collectibles, among many others. Sideshow has listened to collectors' concerns and have addressed the issue and perfected it! Click thumbnail to check out this very interesting read. Latest GG Products Highlighted On You Tube! Gentle Giant, Ltd. advertises their most recent products on a brand new You Tube video found here! It's an amazing video, so don't delay and check it out now! GG Oola Mini Bust Production Photo Posted! Gentle Giant, Ltd. has finally posted an image of the upcoming Oola Mini Bust. This Mini Bust is probably the most vuluptuous one that we will see in our lifetime. Check out all the detail by clicking the thumb below. Masterful, beautiful, and stunning are the only words you can use to describe this amazing collectible! Check it out! GG Luke Skywalker (Bespin Fatigues) Statue! This may just be the year of "Luke Skywalker (Bespin Fatigues)". Gentle Giant, Ltd. has also just posted an image of the upcoming Luke Skywalker (Bespin Fatigues) statue. This statue is incredibly realistic and it appears that Gentle Giant, Ltd. has also raised its own bar with these stunning soon to be released collectibles! Check it out! GG Image Animated Wicket Maquette Painted Released! Gentle Giant, Ltd. has justed posted an image of the painted version of the upcoming Wicket animated maquette. The artistic interpretation of the character is just incredible, including his life-like eyes! Check it out! Hasbro Releasing A Podracer Two-Pack Now? Entertainment Earth just posted an update to what they are calling Wave 8 of The Legacy Collection, (The Phantom Menace wave). The good news is that it looks as if we are getting a Podracer 2-pack. Click through to check out the case assortment! TCW Jabba's Palace Battle Packs Set Variation Found! We are obligated to report that we have found a new variation in The Clone Wars line; this time in the Jabba's Palace Battle Packs set. The first shipment of the Jabba's Palace set had a Jabba with an animated Return Of The Jedi look, while the latest Battle Packs found have him with a new white/cream wash on his head. Although Hasbro's reason for this change is unbeknownst to us at the moment, it is a significant paint application change. Take a deep breath and then click through for the comparison! Check out the Bounty Hunter Update 7.29! ABH is requesting your feedback regarding the Bounty Hunter Capture Log and the all-new Bounty Hunter Podcast. Please take the time to share your opinion on these so that Mark can continue to provide the great service that he is known for! It's "last call" for your Collectormania 15 requests, plus the London Film & Comic Con signing is now online! Also announced: Katie Purvis and Sebastian Dewing offers ending soon! Get the latest details at www.bountyhunter.be! Sideshow Collectibles has just shipped out their first Star Wars Episode III: Revenge Of The Sith Militaries Of Star Wars figure and we can barely contain ourselves and our excitement! The Republic Clone Trooper (212th Attack Battalion: Utapau) is an absolute masterpiece and we are hard pressed to find any complaints, except that we wish we could get our hands on more for army building! Click through for our first impressions and cool photos! Sideshow is guaranteed to give Medicom a run for their money after this one! U-3PO Build A Droid Variation Visually Confirmed! If you're a Star Wars collector, you know that errors, repacks, and variations are an inevitable aspect of the hobby! And you think with a brand new set of figures just released, that we might get a respite from the variation frenzy. But no, we have found the Build A Droid U-3PO in two tones of silver. One has a bright platinum tone, while the other has a rosy or pinkish wash. We are NOT making this up folks, click through for the visual confirmation! If you're a creative collector, you could 'pretend' one is E-3PO! Right now, it appears that the rosy colored U-3PO is the corrected version and the first version of silver parts are already harder to find. TLC TESB Wave 6 Loose Photos Posted! Just posted! Here are some loose photos of our most recent Wave 6 find of The Legacy Collection! At first we thought this was a rather bland wave, but the longer you inspect the figures and play with them, the more you realize just how special they are! Every figure has a certain attention to detail that collectively makes this wave incredible! Click through for the details! The repackaging never ceases! With the recent Wave 6 finds, we have also come across six "new" carry-forward figures with U-3PO Build A Droid parts. We can't fault Hasbro too much, as they have been very diligent about choosing figures that are both popular army builders and fan favorites, so it's all good, right?! Click through for all of the details! Found! TLC Wave 6 At WAL*MART Stores Everywhere! It's about time! While we have been hearing reports since April, Wave 6 from TLC has finally hit hard yesterday and today in the Philadelphia area and is sure to be en masse by the end of the weekend on the East Coast. Get your collective collector radars "turned on" and start your hunting now! While reports have been very slim with any finds at TARGET, WAL*MART seems to be the brick and mortar of choice. And this is a good thing because you will save at least $.50 per figure too! Click through for details! G.I. Joe Best of 80's, Sideshow Cobra Commander and 2009 Clone Wars Wave 2 are some of the great things we have in stock! Old figures, mighty muggs and vehicles have been restocked as well, including AT-AT Vehicles. For more great selections of Star Wars, G.I. Joe, Transformers and MOTU go to this week's newsletter! SDCC09 SC Exclusive 12" Han & Luke Non-Attendee Up! If you are NOT attending Comic-Con this year, it's time to place your pre-order for the Luke & Han Stormtrooper set! Click here to order yours! Hi! - Here is a quick update from www.bigbadtoystore.com about a variety of new arrivals and more new preorders from the last week or so! If you are attending Comic-Con this year, it's time to place your pre-order for the Luke & Han Stormtrooper set! Click here to order yours! Our friends at Saber-Stand.com wanted us to remind you to stop by and check out their stand designed specifically for Star Wars Force FX Lightsabers. Not only do they keep your stand safe from warping, they are quite elegant too! It's a perfect way to display many sabers in a small space! "Ask Sideshow" May 13th Segment Posted! The latest edition of "Ask Sideshow" has been posted for May 13, 2009! Sideshow confirms that all the Episode III clone troopers are in some stage of development for the 12" line. Oh, and they will be finishing off the 212th Attack Battalion in the near future! How exciting is this?! Click the thumbnail below to get all the answers to your many questions. 12" Han & Luke Stormtrooper Production Photos Posted! Sideshow Collectibles has just posted a plethora of production photos for the soon to be pre-ordered Han Solo & Luke Skywalker In Stormtrooper Disguise 12" figure set. Sideshow has definitely raised the bar with this beautiful set of figures and the attention to detail is amazing. Check them out! SDCC Exclusive 12" Han & Luke Pre-Order Details! This upcoming Priority Pre-Order for the Luke Skywalker & Han Solo In Stormtrooper Disguise 12" figure set will be a day long remembered! Click through to read all the Priority Pre-Order details including a tiny edition size of 2000 pieces and a price as high as $199.99 (if you are NOT attending SDCC09). Autograph Bounty Hunter stops by with the Bounty Hunter Update 7.28! The Collectormania 15 lineup has been expanded! Mark announces that Katie Purvis has agreed to sign for all of you cuddly little furball fans out there! Purvis played the maternal Ewok in "Return of the Jedi". There are some updates regarding the Sebastian Dewing signing and your Ahmed Best/Fedcon items have shipped. Get the latest details at www.bountyhunter.be! Luke Skywalker Character Key Is Up For Pre-Order! The Luke Skywalker (Bespin Fatigues) character key, which is limited to only 750 units, is up for pre-order now at ACME Archives. Order yours today for an approximate June 23, 2009 ship date! Sideshow Collectibles has posted an excellent new mini article with one of the production team members involved with their fantastic 12" Imperial Stormtrooper figures. Check out the great and informative short interview here and be sure to order one, two, or seven figures before they are gone forever by clicking the thumbnail below! Hasbro has their latest Galaxy-wide Q&A posted. Click here to see a comprehensive list of all the questions and answers posted in the May 1st edition! New ACME Archives Character Key Announced! It's been quite a while since we have heard something new from ACME Archives with regards to their popular character keys. We are happy to report that The Empire Strikes Back fans' patience has finally paid off and we are getting Luke Skywalker (Bespin Fatigues) as the next key! Click through for the image and pre-order details! StarWars.com posted a magnificent article on the Mexican Lily Ledy 12" figures made during the vintage era. They go into great detail and you may just learn a thing or two that you didn't previously know about them in this very well-written article. Check it out here! Or click through to read the major points of the article. The Sideshow Collectibles General Grievous 1:1 Life Size Bust has been released and JTA is excited to provide you with a ton of photos and first impressions showcasing this magnificent collectible. This bust is nothing but extraordinary to say the very least and every detail of the Separatist general is captured in stunning authenticity and exactness. Click through for an array of pictures and thoughts about this recent acquisition. Sideshow Posts Tease For Han And Luke Stormtrooper! Sideshow Collectibles has just posted a "tease" page for the Priority Pre-order for the Han Solo and Luke Skywalker in Stormtrooper Disguise figure set, which is a bit strange, especially since they showed off much more detail on their Sideshow TV video! But click through to get all your FAQs answered! TLC WAL*MART Exclusive A-wing Found Cheap! The WAL*MART exclusive Green Leader's A-wing Fighter has now been found for the low price of $15.00 on clearance. This may just be your last chance to pick-up this very cool unique pilot and vehicle for a decent price! Click through for the proof! Brand New "Ask Sideshow" Q & A Posted! Sideshow Collectibles updates their site with a brand new edition of "Ask Sideshow" for May 6, 2009. In this date's segment, they wholeheartedly confirm the Premium Format C-3PO and that it will be released/pre-ordered in 2010! Click thumbnail for this news and so much more! The first of the full armored troopers was released this year, and now you can check out the high resolution Imperial Stormtrooper in our Enhanced Visual Guide below! If you haven't picked this one up, they are still in stock at Sideshow Collectibles, and well worth it! Click here to order one! Hi! - Big Bad Toy Store announces a 15% Off sale from now until Thursday, May 7th at www.bigbadtoystore.com. The sale will end around 3:00 Central Time on Thursday. Check out more details here! Sideshow Releases Details On Han & Luke Stormtrooper! Sideshow TV shows off some incredible detail of the upcoming San Diego Comic Con 2009 exclusive Luke Skywalker and Han Solo in Stormtrooper Disguise 12" figure set! Not much was known until now about what delicious accessories and attention these figures have received. Click through for some very quick thumbnails and highlights of what you will expect to see, but definitely check out the video on their website as soon as you can! Hasbro Confirms Another Vintage Figure To Check Off! Rebelscum.com received a follow-up response from Hasbro about the upcoming Ewok Battle Packs set and Hasbro confirmed that we have one more figure to check off of our "Vintage Yet To Be Made" figure list! Read through for the exciting news! Interested in building your own space station? Even more interested in single-handedly destroying the Death Star? Well your dreams can now come true! You can have fun building your own Death Star piñata, and even more fun destroying it in the fine company of your fellow Rebels! Get this craft, as well as recipes and other party ideas, in "The Star Wars Party Book: Recipes and Ideas for Galactic Occasions". Take a look at the materials list and instructions here. For a limited time only, Brian's Toys will be offering domestic shipping & handling at a discounted rate of only $4.99. This offer is good for in-stock orders shipped within the continental United States by June 15th, 2009. When checking out of our website, simply choose the shipping method "Promotional Shipping", or refer to this special offer when you order by phone or e-mail. Click here for Terms and Conditions. We've got our Q&A Round-up ready to go over in our forums. Check out all the questions from around the web right here! Hi! - Here is a quick update from www.bigbadtoystore.com about a variety of new preorders and more new arrivals! Brian's Toys still has the eFX X-Wing available for the low price of $1,199.99! A few new things as well this week, including vintage VGA-Graded NES games, Gentle Giant Bib Fortune statue and plenty of Vintage AFA loose figures. Also, Brian's Toys will be receiving X-Men Origins: Wolverine & Marvel Universe figures soon and currently are taking pre-orders. For more great products and pre-orders, go to this week's newsletter! Exciting news from the Bounty Hunter! Bounty Hunter Update 7.27 announces the all-new Bounty Hunter Podcast! You can now subscribe to the Bounty Hunter Capture Log on your computer, or download it to your iPhone/iPod with an iTunes account. Also, be on the lookout for your Collectormania Midlands and Autographica items, as they will ship early next week. Take a look at the newly added Collectormania 15 offer as well. All this and more at www.bountyhunter.be! Hasbro reports in with the latest answers to our questions! Click here for all the details! On the heels of yesterdays mini photo gallery of this very cool collectible, we have the full Enhanced Visual Guide of Gentle Giant's Shaak Ti Mini Bust. Click below for all the high resolution details!